In case you have not heard, #crossiscoming. The Crosshairs Cycling team has been logging lots of miles and is ready for another cyclocross season. Although some of the team’s familiar faces will be missing this year from the MABRA scene, we are happy to say that both Elliott Caldwell and Kevin Hays will still be representing Crosshairs Cycling in their new local races. MABRA is still stuck with the rest of us though. This spring and summer has been full of early rainy, and now hot days, but that has not stopped the team from participating in some of the area’s races. There were quite a few black and blue jerseys mixing it up at the local mountain bike race series, Wednesdays at Wakefield, and there have also been some Crosshairs jerseys spotted on the pavement in some junior events. The Crosshairs team spends a good amount of time riding the trails, and we also have teammates that build them. Carlo Alfano has been spending a lot of 2016 (and much more time before) working to make the new Rivers Edge Recreation Park Trail Project (http://www.more-mtb.org/product/brunswick/) a reality. In a partnership with MORE, their goal is to create a great trail experience for all users in the Frederick-Loudoun area. After spending some time this summer at the Cutaway Bike Camp, Alex Alfano will definitely be ripping the new trails in the future. Despite the temperature hovering around 100 degrees, Libbey Sheldon took 4th place at the Wilderness 101. Libbey also took part in the Tour de Burg where she and fellow teammates, Chris and Jonah Merriam, were challenged to five days of racing both mountain and road bikes. Those five days of riding in the Massanutten Mountains will surely pay off this fall. Some of the team’s newest members Matt Berry and Sam Kristy have both been posting great results on and off road this summer, and are sure to be in front of the pack when the cross season starts. The Super Eight Series (http://www.super8cx.org) has been posted, so mark your calendars and keep training. To get yourself ready for the upcoming season there are still a few spots open for the a two-day Washington DC cyclocross camp with three-time and current US National Cyclocross Champion Jeremy Powers. 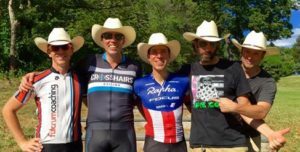 Fulcrum Coaching, In The Crosshairs and DCMTB will be hosting the one-of-a-kind cyclocross experience so sign up today (https://www.bikereg.com/jeremy-powers-dc-cross-camp). When the Crosshairs Cycling team is not out riding bikes, most of us spend time with our furry teammates (no not the bearded ones). We would like to thank Atlas Vet for not only being part of our team, but also keeping our pets healthy and happy through every race season. Go check them out at online (http://www.atlasvetdc.com/index.php) or their H Street location.